I have been thrifty with my trips to the thrift shops, trying to bring a little less home while I work on the clutter that is already here. There are some things I just can’t leave behind if they are marked at a good price; like Wilton cake pans. I don’t bake molded cakes like these nor do I intend to. But I just can’t resist picking up a cake pan if the price is right. 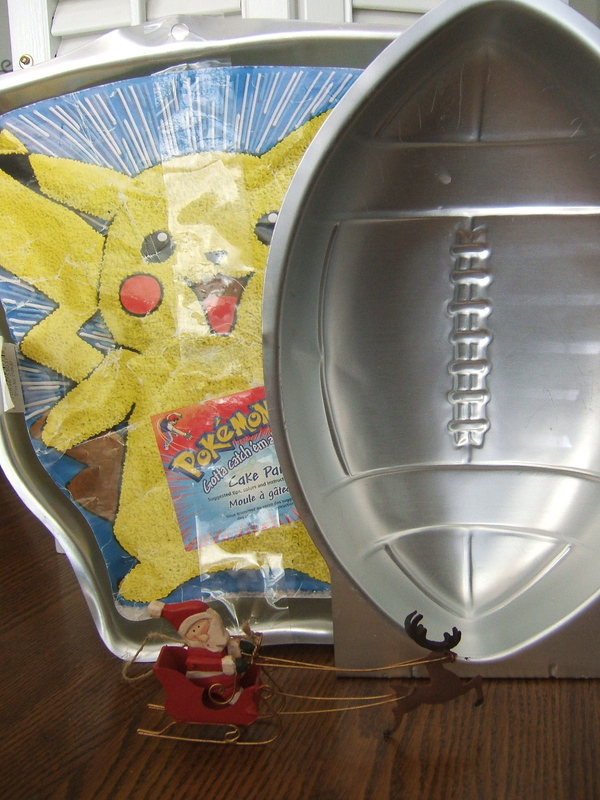 So here I have a Pokeman pan and a football shaped pan. I really do hope I can find the time to list some of my Wilton cake pan collection on Ebay. If I sell some of what I have collected, then I won’t feel so guilty picking up the next priced-just-right pan. Right? I thought that perhaps this cute little Santa and his reindeer was going to be on sale. He wasn’t. I’m glad I picked him up anyway. For 75 cents I think he will bring a lot of Christmas joy to our home next decorating season. Here he is again showing off the silver-plate bowl I found. This piece could use some polishing; however, I’m currently using it in its tarnished glory to hold mail and miscellaneous bits and pieces of paper clutter. I really liked the shell-like design on the edge of this container. It is EPCA Bristol Silver by Poole. I have learned that EPCA stands for Electro Plated Copper Alloy. 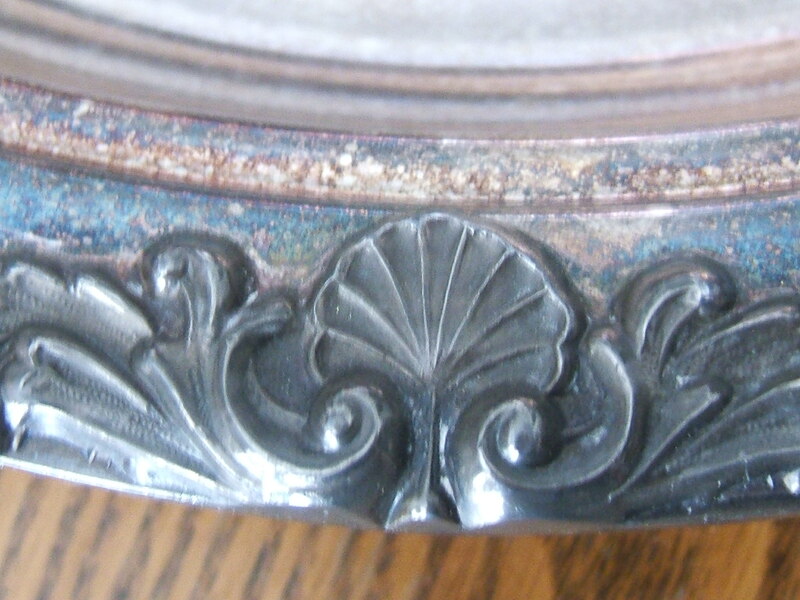 It is nickel silver that has been silver-plated. I like the weight and size of this piece and happily paid $1.75 for it. 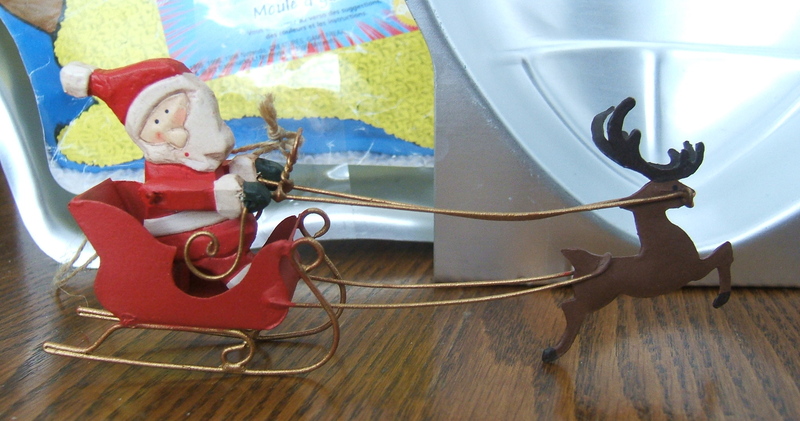 This entry was posted in Santa, Silver, Thrifting, Uncategorized, Vintage. Bookmark the permalink. I say “grab them when you can.” You just never know when you’ll come across more at such great prices. 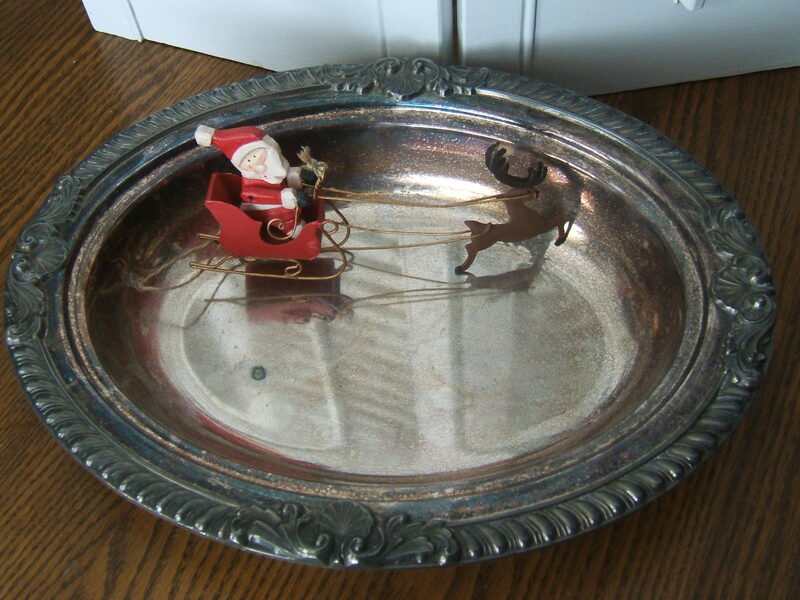 Such a sweet little Santa and I love that silver bowl. What great finds! Isn’t Ebay great for selling the things we finally decide we don’t want or need? That bowl is to die for!! Personally, I’d leave it in it’s ‘tarnished glory’ — you really see all of the great details on it that way. you got some great stuff! That little Santa and raindeer is adorable! The silver dish and the cake pans are cool. I don’t know if you can ever have to many of what you love! Oh, I have a very hard time passing up thrifty Wilton products! Love the tray as well. Thank you for joining TTF and have a fabulous weekend! What a sweet santa and reindeer set. Each and every time I attempt to access the web-site, this message comes up: “403 Forbidden – You don’t have permission to access / on this server. Additionally, a 500 Internal Server Error error was encountered while trying to use an ErrorDocument to handle the request.” I’ve never came across a issue like this before; is this through some wrong doing of mine, or is there something wrong with the page itself?